In the past few days here at 14 Weeks Worth of Socks we have just achieved the milestone of 1000 followers. To celebrate this, we are going to have another giveaway. 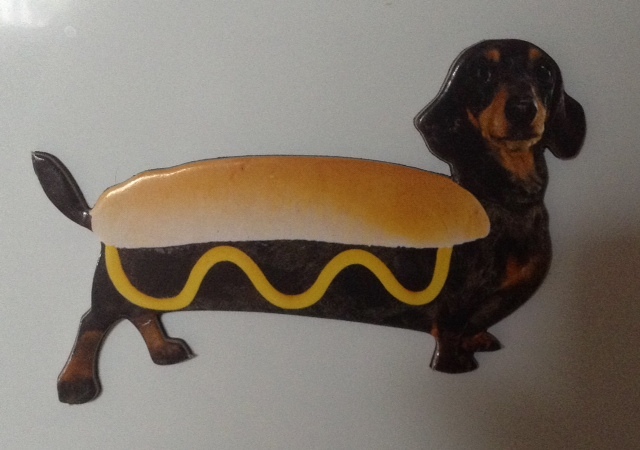 This time, the prize is a super cute hotdog dachshund fridge magnet. To enter the draw, just comment on this post as to what you like about my blog and/or which post you particularly enjoyed, or even what you’d like me to blog about in future. The winner will be chosen at random from those who comment on this post and will be announced on 31 October 2014. I will ship worldwide – so don’t let your location stop you from entering! I love dachshund. The magnet is super cute. I enjoy reading your travelogue of Asian countries, so far my favourites are Japan and India. Just a few days until we announce a winner. Make a comment if you want to be in to win. Honestly, I was sucked by your post about old dogs, of which I and my wife also quite fond. Then you made the mistake of having a large collection of WW2 diary entries. Now I might have to start paying more attention. I found your blog because of the dachshunds 🙂 I too am a dachshund lover ( I have two). But I enjoy reading about your travels too!